All the tears and frustration seem worth it - just for those precious 30 seconds of performance time - and then reality dawns: you're back to square 1. How do I get my child to practise in between music lessons without my morphing into Cruella De Ville? You're not alone. In fact, unless your child is the Hermione Granger type, who relishes the hours spent diligently pawing over a theory book (or, in this case, scales), keeping up the practice momentum can be a battle: an almost impossible task, and one that certainly adds more pressure on top of homework, going to bed on time and actually spending that all important quality time together, as a family, each week. What is music practice and why is it important? There is no denying that regular, focussed practice at home, whatever your child’s age, plays a vital role in becoming a better player. But, while playing music can be huge fun, practising regularly can be perceived as challenging, boring and time consuming for a young person. Practising is, after all, the process of getting closer to achieving your own musical goals. This involves concentrating on the things that you find tricky and playing them over and over until they become easier. Once your child gets into the habit of practising regularly, playing the instrument becomes a lot of fun, but if no practice happens in between music lessons, your child’s finger muscles won’t remember what it is they are supposed to be doing and he won’t make any progress. And, let’s face it, playing an instrument isn’t much fun when you’re not making any progress! Here some things you can do at home to make practising more accessible, rewarding and ultimately fun for your child. 1. Don't be afraid to talk to your child’s music teacher. The first thing I would point out here, is that not all children, and boys especially, are great at sitting still for long periods of time concentrating on one thing. Knowing the beast as far as your child is concerned is very important, as is maintaining good communication lines with your child's teacher. If the teacher is worth her salt, she will get to know your child well and will quickly learn what makes them tick. If practice at home is waning, they will be able to suggest fun activities for your child to do at home to keep things interesting, as well as choosing appropriate pieces for them to learn. If you feel at any point that the teacher's expectations are unrealistic, or that practising at home is having a detrimental effect on your child's interest in the instrument itself, I urge you to thrash these issues out with the music teacher. In this instance, two heads are better than one! Finding a teacher that is right for your child is also a critical point here. Look locally but look for recommendations too; companies like www.discoverandbe.com offer a fun and up to date approach. This will sit much better with children than the old fashioned and somewhat stilted music lessons. 2. Little and often is KEY. As I said above, however naturally musically talented your child is, the chances are that they will not be up for sitting at the piano for 30 minutes practising scales and tricky pieces over and over again 5 days a week. Little and often is the way to go here, especially for younger children (under 8), and preferably at a time when your child is motivated and awake (e.g. straight after breakfast for 10 mins). Younger children do need parental help to schedule music time into a weekly routine (just like snack time /bath time, etc.) so don't be afraid to pin point a good opportunity to slot it into your week. Speak to your child’s music teacher about how often your child should be practising. For children under 8, I recommend aiming for between 10 – 20 minutes per practice session at least 3 times a week. Some children may be happy to do more. If, like me, you would rather not take on a Cruella De Ville persona when it comes to encouraging your child to practise, there are definitely some things you can do to help. For some children it might be advantageous to not use the P (practise) word - it depends on the child. 'Music time' could be a time that involves enjoying and exploring the instrument, listening to music, playing musical games, practising the activities set by the music teacher and making up music. Download some music based apps and games (e.g note recognition games, rhythm games, timing games, etc). There are some brilliant music education apps out there and children love using them. I mentioned above how I love an incentive. These games are a great way to finish off practice time if your child is keen. 4. Know when to step back and when to get involved! Judging when is the right time to encourage your child to take ownership and practise independently is a tricky one. Children need opportunities to explore their instrument freely without having to practise specific pieces, but they also need direction when it comes to practising pieces and exercises set by the teacher. The key is to vary practice slots. For example, one practice could focus on pieces, another on playing whatever they want to play, another on making up their own music, and so on. Young children love it when parents get involved with their learning journey. (I know time doesn't always allow but doing this at least once a week can make all the difference.) Have a go at playing one of your child’s pieces. Let them teach you how to play it, or play it wrongly deliberately, and watch them gleefully show you how it is supposed to be played! 4. Value your child’s music time. Create a special practising ‘oasis’ or space in the house, complete with a drawer for special stickers for great practising, a little finger monster/puppet for helping fingers to find notes, a special pencil for writing with, a special cushion and a funky music stand if your child needs one. Make sure you and your child find the time to communicate back to the music teacher by regularly writing in the practice diary together - even if it's one sentence. This gives value to practice time and shows your child that it's important to you that he tries his best. 5. Make music an integral part of family life. 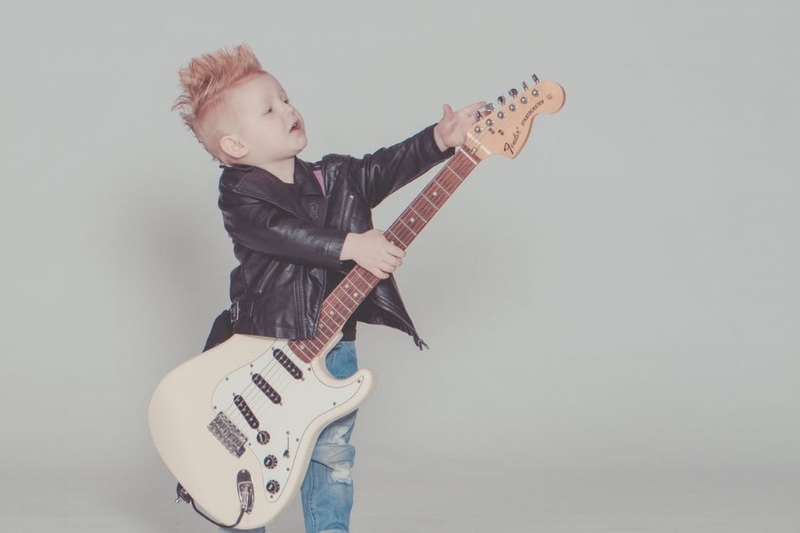 The more your child is immersed in music from an early age, the more likely he will be to go to the piano or the drum kit of his own accord to practise because he wants to - and with no Cruella De Ville in sight!